With the holiday gift-giving season upon us, we thought it was fitting to recognize what we believe is the greatest gift a parent can give a child…it can’t be wrapped, it can’t be opened, it can only be experienced…because it is the gift of CAMP. Our campers tell us repeatedly throughout the summer how thankful they are. During our weekly Friday Night Services, we take time to reflect, appreciate and value all that camp gives us. When parents send us (and are surprised by) letters of gratitude that they receive from their camper, we remind them how much of our program is about appreciating how lucky we are to have the privilege of camp. Camp Towanda is proud to support and be involved with many philanthropic organizations. We teach, demonstrate and encourage our campers and staff about the importance of giving back, being involved and caring. There are several opportunities during camp and throughout the year for our families to get involved, including the Foundation Fighting Blindness Vision Walk, Project Morry Swim-a-Thon, Walk-a-Thon and Basketball-a-Thons, and SCOPE (Summer Camp Opportunities Promote Education). At Camp Towanda, giving back is so important to the fabric of our camp and culture and as a result, campers gain an even deeper appreciation for their own experiences. As many of you know, Mitch is president of this national organization that provides underprivileged children the opportunity to experience the advantage and edge of sleep away camp. SCOPE funds camperships at non-profit residential camps (thusly, helping the camps, too) and following through with college support. Many Towanda campers, staff, parents, alumni and friends have contributed time, energy and money to SCOPE. 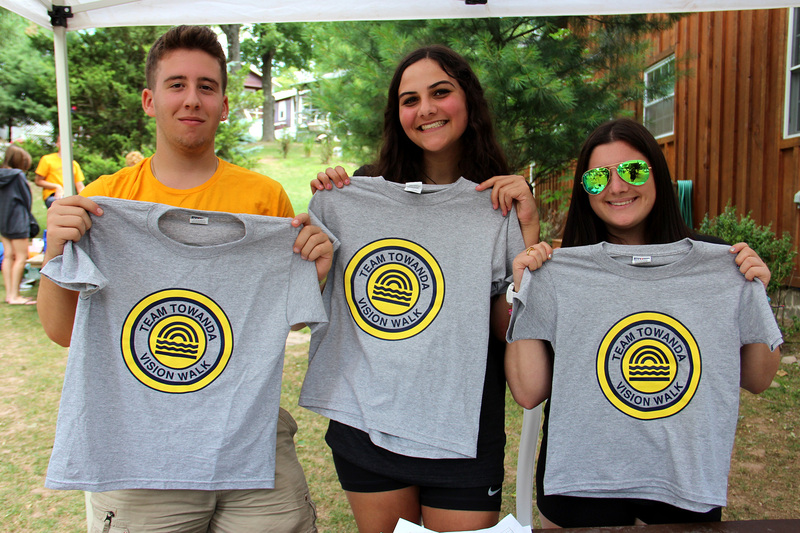 Some efforts include events and sales during the summer, volunteering at off-season fundraiser events, creating school events that support, Mitzvah projects and business contributions. Our Dorm, Club, LIT and CITs are involved in the SCOPE Junior Leadership Council. And Jared Reiter is on the Young Leaders Board! Shout out to Evan Seiden for organizing a Bake Sale at his school that netted $350.00 and www.MitzvahMarket.com, Modell’s Sporting Goods and all of our camper volunteers at recent events (Allie Chaiken, Evan Seiden, Josh Merlin, Huggie, Jake Weinstein and Sydney Levy). 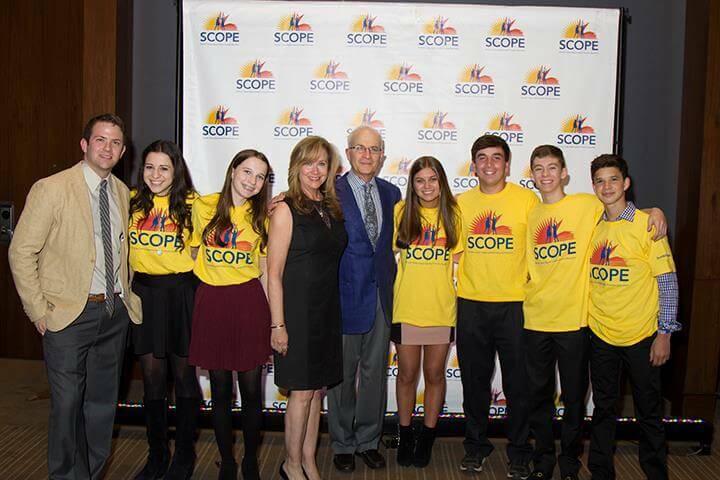 Check out SCOPEUSA.ORG for the latest events for all ages. We are looking for volunteers for the April 5 Benefit Dinner at the Conrad Hotel in Manhattan (where we will officially welcome Towanda Alumni Hank Azaria to the Honorary Board)! ALL ARE WELCOME TO ATTEND AND SUPPORT! THIS FUN EVENING! To our Floridian Families; SCOPE is currently looking for an adult to head up our SouthEast Chapter; please contact Mitch if you are interested. This is a great opportunity! SCOPE currently has chapters in New York, Chicago, South Florida, Texas and we are always looking to expand (Anyone for New England or West Coast?). There are other ways to #SupportScope, including starting a SCOPE fundraiser in your own community. Visit their website to learn more! In the summer we swim laps and shoot hoops to help send kids to camp. You can also support this organization year-round through their website and winter events and auctions. Congratulations To Janine and Stephen Rosen (Stephen is Alum) on bidding and winning The Morry’s Camp online tuition bid. Twelve camps (including Towanda) donated a camper tuition to help raise funds for Project Morry. Of all the camps and bidders; The Rosen’s won! We are very proud of their generosity and support! You can still purchase a Vision Walk T-Shirt designed by our LITs of 2015 and proceeds go to Foundation Fighting Blindness. Send a $25 check to Camp Towanda. The Spring, 2016 VisionWalk date has not yet been announced…but get your shirt ready! And thank you to all our camp families that donated during our Holiday Food Drive at the NY Area Reunion! Coming in the next issue of The Towanda Times will be information on our very own Towanda Campership Fund! Together we can share the gift of camp and pay it forward!